Children put the family in Abilene Family Dentistry! We’re delighted to help little ones learn how to take great care of their smiles so they can keep sharing that source of joy for years to come. We know that dental offices can seem like scary places, but our warm atmosphere, gentle care, and enthusiastic teaching tends to melt fears away and open children up to oral health exploration. It’s important to us that all our patients feel safe and comfortable in our hands, especially children, because positive dental experiences at a young age can ensure healthy habits for life! Schedule your cherub’s check-up today! In a mouth far, far away… okay, we’re a little silly, but kids bring that side out of us. We want them to have fun before we start examining their mouths, and we think one of the best ways to put them at ease and help information stick is to make it fun—although a lot of the information we have to share may pertain mostly to you until your pride and joy is old enough to take their toothbrush into their own little hands. You’ll want to bring your child in for their first visit shortly after you’ve celebrated their first birthday. However, their oral care should start earlier at home. Softly wiping their gums with a warm, wet washcloth after they’ve eaten or drank anything besides water can minimize acidity and bacteria. This habit may soothe them as they teethe, too! When their first baby (or deciduous) tooth pokes through the gums, you can begin gently brushing with a small, baby-sized toothbrush or finger brush and a teeny amount (think a grain of rice) of training toothpaste. Dental floss should be introduced as more teeth erupt and they begin to touch. Little ones generally need assistance flossing and brushing until around the age of six. We suggest supervising them as they develop the habit and doing so until you’re confident in their thoroughness. We know your child’s health and happiness are your top priority, and that’s why we want to help you instill good habits right from the beginning. Preventing tooth decay and gum disease keeps your child from experiencing painful interruptions in their school and playtime. These common infections can impede your child’s nutritional and emotional development, and their performance in school. If they suffer premature tooth loss, the chances they’ll need orthodontic treatment increase due to permanent teeth shifting before erupting. We’re big on prevention methods at Abilene Family Dentistry. We don’t know of anyone that wants to spend a lot of time in the dental chair beyond their twice annual exams and cleaning—we try not to take it too personally. 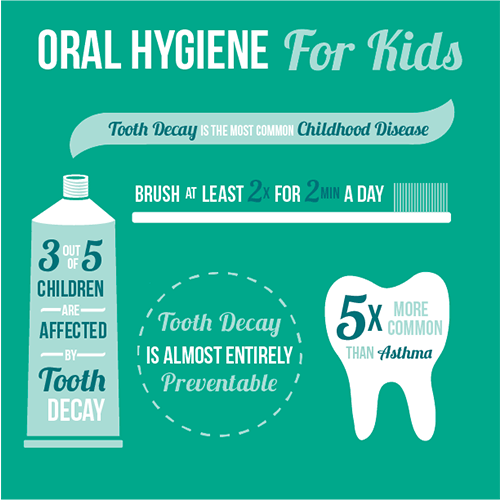 Instead, we understand and are happy to beef up your child’s defense against decay in the form of dental sealants. Dental sealants are thin coatings applied to the chewing surfaces of your child’s molars (back teeth). These surfaces are a favorite meeting spot for food debris and decay-causing bacteria that can be missed by children still perfecting their brushing technique. When dental sealants are applied, they can reduce the risk of cavity formation by nearly 80%, and they can last for several years while your child continues to improve their hygiene routine. Another helpful tooth decay prevention method comes in the form of fluoride varnishes. The magic of fluoride lies in its ability to remineralize tooth enamel. The acidity of food and beverages your child consumes combined with bacteria and plaque create the perfect storm for enamel erosion. If enough of the enamel is eroded, the infection and decay can reach your child’s dentin and require fillings, or, if the infection claimed a large portion of healthy tooth structure, a crown. Fluoride can safely reduce this risk by 20-40%. This means healthy diets and hygiene habits will still be necessary to keep up on! If you have any questions about pediatric dentistry or would like to schedule a visit with your Abilene family dentists, Dr. Webb and Dr. Awtrey, give us a call today or schedule an appointment online! We look forward to seeing the growing smiles in your family!